"A beer that has a dominant malty taste. This beer’s origins in a monk’s recipe are reflected in its heartiness. The Pope of Beers, Conrad Seidl, describes it as: “Almost black with a very slight red tone, a sensational, festive foam and truly extraordinary fragrance that at first summons up visions of greaves lard. The first taste is of mild fullness with an accompanying coffee tone, which becomes more dominant with the aftertaste. 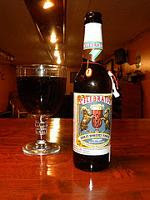 There is very little of the sweetness that is frequently to be tasted with doppelbock beer.” The Ayinger Celebrator has been ranked among the best beers of the world by the Chicago Testing Institute several times and has won numerous platinum medallions." This beer pours a deep deep red. There was a 2 finger head that dissipated so fast I couldn't catch it with a camera. The aroma is heavy on roasted malt with hints of coffee and yeast. This is very roasty and malty with a with a nice coffee finish. It has thick mouth feel and is full bodied, very well balanced. My overall impressions of this beer is great. As a fan of darker beers I am always looking for something that stands apart, this did that very well. It is very well balanced with a nice roasty malty flavour. A great fall beer! I would rate this a 8.5 out of 10.